The Florida East Coast Railway ( AAR reporting mark FEC) is a Class II railroad operating in the U.S. state of Florida; in the past, it has been a Class I railroad. The FEC is renowned as the railroad that built the first railroad bridges to Key West that have since been rebuilt into road bridges for vehicle traffic, now known as the Overseas Highway. It was originally known as the Florida Coast and Gulf Railway and then the Jacksonville, St. Augustine and Indian River Railway; for more information and other former railroads merged into the line, see the family tree below. The Florida East Coast Railway (FEC) was developed by Henry Morrison Flagler, a United States tycoon, real estate promoter, railroad developer and Rockefeller partner in Standard Oil. Originally based in Cleveland, Ohio and formed as Rockefeller, Andrews & Flagler in 1867, in 1877, Standard Oil moved its headquarters to New York City, and Flagler and his family moved there as well. He was joined by Henry H. Rogers, another leader of Standard Oil who also became involved in the development of America's railroads, including those on nearby Staten Island, the Union Pacific, and later in West Virginia, where he eventually built the remarkable Virginian Railway to transport coal to Hampton Roads, Virginia. 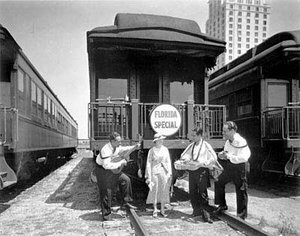 Promotional excursions such as the Florida Special helped make the state the tourist "Mecca" it is today. Henry Flagler's non-Standard Oil interests went in a different direction, however, when in 1878, on the advice of her physician, Flagler traveled to Jacksonville, Florida for the winter with his first wife, Mary, who was quite ill. Two years after she died in 1881, he married one of Mary's former caregivers. After their wedding, the couple traveled to St. Augustine, Florida. Flagler found the city charming, but the hotel facilities and transportation systems inadequate. He recognized Florida's potential to attract out-of-state visitors. Though Flagler remained on the Board of Directors of Standard Oil, he gave up his day-to-day involvement in the corporation in order to pursue his interests in Florida. When Flagler returned to Florida, in 1885 he began building a grand St. Augustine hotel, the Ponce de León Hotel. 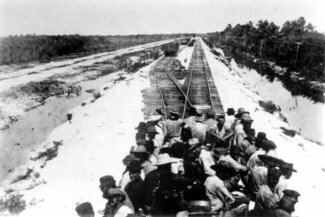 Flagler realized that the key to developing Florida was a solid transportation system and consequently purchased the Jacksonville, St. Augustine and Halifax Railroad. He also noticed that a major problem facing the existing Florida railway systems was that each operated on different gauge systems, making interconnection impossible. Shortly after purchasing the Jacksonville, St. Augustine and Halifax Railroad, he converted the line to standard gauge. The earliest predecessor of the FEC was the narrow-gauge St. John’s Railway, incorporated in 1858, which constructed a now-abandoned line between Tocoi and St. Augustine. In 1883, Henry M. Flagler, now retired from Standard Oil, moved to St. Augustine and purchased several hotels. The East Coast of Florida was relatively undeveloped at that time, and Flagler found it difficult to obtain the construction materials he needed. In 1885, Flagler purchased all assets of the Jacksonville, St. Augustine & Halifax River Railway; as the railroad expanded southward, the company was eventually re-named “Florida East Coast Railway Company – Flagler System” on September 7, 1895. The Jacksonville, St. Augustine and Halifax River Railway served the northeastern portion of the state and was the first property in the Flagler Railroad system, which would eventually become the Florida East Coast Railway Company. Before Flagler bought the organization, the railroad stretched only between South Jacksonville and St. Augustine and lacked a depot sufficient to accommodate travelers to his St. Augustine resorts. Flagler built a modern depot facility as well as schools, hospitals and churches, systematically revitalizing the largely abandoned historic city. Flagler next purchased three additional existing railroads: the St. John's Railway, the St. Augustine and Palatka Railway, and the St. Johns and Halifax River Railway so that he could provide extended rail service on standard gauge tracks. Through the operation of these three railroads, by spring 1889 Flagler's system offered service from Jacksonville to Daytona. Continuing to develop hotel facilities to entice northern tourists to visit Florida, Flagler bought and expanded the Ormond Hotel, located along the railroad's route north of Daytona. Beginning in 1892, when landowners south of Daytona petitioned him to extend the railroad 80 miles south, Flagler began laying new railroad tracks; no longer did he follow his traditional practice of purchasing existing railroads and merging them into his growing rail system. Flagler obtained a charter from the state of Florida authorizing him to build a railroad along the Indian River to Miami and as the railroad progressed southward, cities such as New Smyrna and Titusville began to develop along the tracks. The Florida East Coast Railway depot in Sebastian, Florida. The structure was built in 1893. By 1894, Flagler's railroad system reached what is today known as West Palm Beach. Flagler constructed the Royal Poinciana Hotel in Palm Beach overlooking the Lake Worth Lagoon. He also built The Breakers Hotel on the ocean side of Palm Beach, and Whitehall, his private 55 room, 60,000 square foot (5,600 m²) winter home. The development of these three structures, coupled with railroad access to them, established Palm Beach as a winter resort for the wealthy members of America's Gilded Age. Palm Beach was to be the terminus of the Flagler railroad, but during 1894 and 1895, severe freezes hit all of Central Florida whereas the Miami area remained unaffected, causing Flagler to rethink his original decision not to move the railroad south of Palm Beach. It is said that Julia Tuttle, one of two main landowners in the Miami area along with the Brickell family, sent orange blossom to Flagler to prove him that Miami, unlike the rest of the State, was unaffected by the frost. To further convince Flagler to continue the railroad to Miami, both Julia Tuttle and William Brickell offered land to the Florida East Coast Canal and Transportation Company, and the Boston and Florida Atlantic Coast Land Company in exchange for laying rail tracks. On September 7, 1895, the name of Flagler's system was changed from the Jacksonville, St. Augustine and Indian River Railway Company to the Florida East Coast Railway Company and by 1896, it reached Biscayne Bay at present day downtown Miami, at the time a small settlement of less than 50 inhabitants. When the town incorporated in 1896, its citizens wanted to honor the man responsible for the city's development by naming it, "Flagler." He declined the honour, persuading them to keep the city's old Indian name, "Miami." The area was actually previously known as "Fort Dallas" after the Fort built there in the 1830's during the second Seminole War. To further develop the area surrounding the Miami railroad station, Flagler dredged a channel, built streets, instituted the first water and power systems, and financed the town's first newspaper, the Metropolis. Flagler was a great visionary and he can be credited for the development of the entire east coast of Florida. Yet he lacked vision on at least one issue: he felt that Miami would never be more than a fishing village. As of 1905, Flagler started what everybody considered a folly: the extension of the FEC to Key West which would later be known as "The Overseas Railway," at the time considered the eighth wonder of the world and surely the most daring infrastructure ever built exclusively with private funds. The first train arrived in Key West on January 22, 1912. 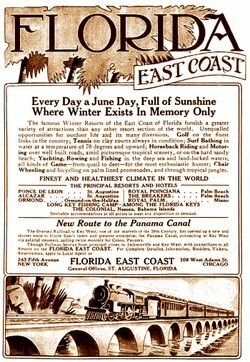 A 1913 print advertisement extols the many advantages of traveling on the Florida East Coast Railway, the "New Route to the Panama Canal." The railroad south of West Palm Beach was constructed in phases by the FEC and the predecessor systems. Flagler began his railroad building in 1892. Under Florida’s generous land-grant laws passed in 1893, 8,000 acres (32 km²) could be claimed from the state for every mile (1.6 km) built. Flagler would eventually claim a total in excess of two million acres (8,000 km²) for building the FEC, and land development and trading would become one of his most profitable endeavours. Before it became the FEC, the Jacksonville, St. Augustine & Indian River was constructing a line southwards from Daytona Beach in 1894. Fort Pierce was reached on January 29, and West Palm Beach on March 22. Further extension southwards did not begin until June of 1895, when a favorable deal was signed with Miami-area business interests. Fort Lauderdale was reached on March 3 of the following year. By April, the construction reached Biscayne Bay, the largest and most accessible harbour on Florida’s east coast. To further develop the area surrounding the Miami railroad station, Flagler dredged a channel, built streets, instituted the first water and power systems, and financed Miami’s first newspaper, the Metropolis. 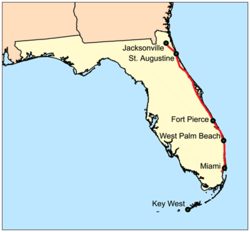 Flagler announced in 1905 that the FEC would be extended 128 miles to Key West over the ocean. The "Overseas Extension" was completed in 1912, a mere 16 months prior to Flagler’s death, at a cost of $27 million and lives of hundreds of workmen. Never one to rest on his laurels, Flagler next sought perhaps his greatest challenge: the extension of the Florida East Coast Railway to Key West, a city of almost 20,000 inhabitants located 128 miles beyond the end of the Florida peninsula. Flagler became particularly interested in linking Key West to the mainland after the United States announced in 1905 the construction of the Panama Canal. Key West, the United States' closest deep-water port to the Canal, could not only take advantage of Cuban and Latin America trade, but the opening of the Canal would allow significant trade possibilities with the west. The construction of the Overseas Railroad required many engineering innovations as well as vast amounts of labor and monetary resources. At one time during construction, four thousand men were employed. During the seven year construction, five hurricanes threatened to halt the project. Despite the hardships, the final link of the Florida East Coast Railway was completed in 1912. In that year, a proud Henry Flagler rode the first train into Key West, marking the completion of the railroad's overseas connection to Key West and the linkage by railway of the entire east coast of Florida. The stock market crash of 1929 was particularly harsh on the FEC. The railroad was in receivership by September 1931, a short 18 years after Flagler’s death. Bus service began to be substituted for trains on the branches in 1932, and the Key West Extension was abandoned after the Labor Day Hurricane of 1935. However, streamliners terminating in Miami nevertheless plied the rails between 1939 and 1968, including such famous trains as “The Champion”, jointly operated with the Atlantic Coast Line. The FEC had barely emerged from bankruptcy in 1961 when a labor contract negotiation turned sour, leading to a prolonged work stoppage beginning January 23, 1963. Although freight trains were operated with non-Union and supervisory crews, passenger runs were not reinstated until later. During the stoppage, Miami’s wooden-construction downtown passenger terminal was demolished on November 12, 1963. The passenger runs reinstated in 1965 between Jacksonville and Little River (NE 79th St.), with a single diesel and two streamlined passenger cars, would continue six days a week until it was finally discontinued on July 31, 1968. In 1913, Flagler fell down a flight of stairs at Whitehall. He never recovered from the fall and died in West Palm Beach of his injuries on May 20, 1913, at 84 years of age. He was buried in St. Augustine alongside his daughter, Jenny Louise and first wife, Mary Harkness. Only his son Harry survived of the three children by his first marriage in 1853 to Mary Harkness. There is a monument to him in Biscayne Bay, and a college (Flagler) named after him in St. Augustine, Florida. The Florida East Coast Railway was the product of Flagler's resources and imagination. Flagler's construction of hotels at points along the railroad and his development of the agricultural industry through the Model Land Company established tourism and agriculture as Florida's major industries. Hundreds of workers on the Florida East Coast Railway's Overseas Extension were lost when a hurricane swept the through the Keys and battered Miami on October 18, 1906. Nearly a century later, the effects of Henry Flagler's incredible accomplishments can still clearly be seen throughout Florida. Perhaps even more amazingly, as Florida is now well-known as a retirement state of preference for many Americans, Flagler accomplished these feats after retiring from his first career. Flagler had already founded and developed the vast empire of Standard Oil with partners John D. Rockefeller, Samuel Andrews, and Henry H. Rogers before becoming interested in Florida. Linking the entire east coast of Florida, a state that at the time was largely an uninhabited frontier, demanded a great deal of foresight and perseverance. The Florida Overseas Railroad, also known as the Key West Extension of the Florida East Coast Railway, was heavily damaged and partially destroyed in the Labor Day Hurricane of 1935. The Florida East Coast Railway was financially unable to rebuild the destroyed sections, so the roadbed and remaining bridges were sold to the State of Florida, which built the Overseas Highway to Key West, using much of the remaining railway infrastructure. A rebuilt Overseas Highway ( U.S. Route 1) following Flagler's dream, continues to provide a highway link to Key West, ending at the southernmost point in the continental United States. The Florida East Coast Railway continues to operate from its headquarters in St. Augustine using nearly the same route developed by Flagler (the Moultrie Cutoff was built in 1925 to shorten the distance south of St. Augustine). Today the company only provides freight service — passenger service was discontinued in 1968 after labor unrest that resulted in violence. However, there has been some speculation that the southern end of the FEC line may be used for a commuter rail service to complement the existing Tri-Rail line and that Amtrak may be allowed to use FEC lines for a more direct route between Jacksonville and Miami. The FEC currently transports Tropicana Products' " Juice Train" cars to and from the company's processing facility in eastern Florida. For many years the company was controlled by Edward Ball, who headed the trusts set up under the will of his brother-in-law Alfred I. du Pont and associated business interests. His "Pork Chop Gang" was also a powerful force in Florida state politics. Later, after 36 years with the railroad Raymond Wyckoff took the helm on May 30, 1984, the same year that F.E.C. Industries was made the holding company for the Railway and the Commercial Realty and Development Company, a structure which persists to this day. As of March, 2005 Robert Anestis stepped down as C.E.O. of F.E.C. Industries after a 4 year stint, allowing Adolfo Henriquez to assume that position, with John McPherson, a long-time railroad man, continuing as President of the Railway itself. On May 16, 2006, FEC was the recipient of the Gold E.H. Harriman Award for safety in Group C (line-haul railroad companies with fewer than 4 million employee hours per year). The Jacksonville, St. Augustine and Indian River Railway Company was incorporated under the general incorporation laws of Florida to own and operate a railroad from Jacksonville in Duval county, through the counties of Duval, St. Johns, Putnam, Volusia, Brevard, Orange, Osceola, Dade, Polk and Hillsborough, in the State of Florida. Florida state law chapter 4260, approved May 31, 1893, granted land to the railroad. At that time, it was already in operation from Jacksonville to Rockledge, the part south of Daytona having been constructed by them. The company had just filed a certificate changing and extending its lines on and across the Florida Keys to Key West in Monroe county, Florida. The name was changed to the Florida East Coast Railway Company on September 7, 1895. South of Holopaw, the line roughly parallels US 441. The Enterprise Branch (E-branch) was built in 1885 by the Atlantic Coast, St. Johns and Indian River Railroad and leased to the Jacksonville, Tampa and Key West Railroad, part of the Plant System. Initially, the westernmost five miles served as a connection from Enterprise Junction to Enterprise, a port for steamboat traffic down the St. Johns River. Later, the line was built through Osteen, Kalamazoo, and Mims to Titusville. A steam locomotive pulled the first train over the line onto the wharf on the Indian River at Titusville on the afternoon of December 30, 1885 and greatly accelerated the transportation of passengers, produce, seafood, and supplies to and from central Florida. While Titusville thrived thanks to this new transportation connection, Enterprise lost stature as a steamboat port, since Henry Plant's railroad paralleled the St. Johns River and greatly reduced travel times to Jacksonville. During the winter of 1894–95, a widespread freeze hit twice, decimating the citrus crop and ruining that part of Florida's economy. This allowed Henry Flagler to acquire the line at a discount to piece together what became the Florida East Coast Railway. The track of the E-branch has been uprooted as far as Aurantia, about five miles northwest of Mims, ending directly under the Interstate 95 overpass and has been abandoned. The crossing gates and signals were removed before the summer 2004 hurricanes and the track is being removed by a steel salvage company. This rail line would have been suited to recreational railroad use by such groups as the North American Rail Car Owners' Association assuming a representative who is local to the area could have been located. Otherwise, it is likely that the right-of-way will be converted to a multi-use trail. In many cases the Surface Transportation Board grants abandonment exemptions on the condition that the right-of-way become railbanked. Under this arrangement, if demand for rail service should arise in the future, rails could be rebuilt. This branch, from Blue Spring on the St. Johns River via Orange City to the main line in New Smyrna Beach, was built by the Blue Spring, Orange City and Atlantic Railroad. In the mid- 1880s it became the Atlantic and Western Branch of the Jacksonville, St. Augustine and Indian River Railway, which changed its name to the Florida East Coast Railway in 1895. It may have been the Atlantic and Western Railroad in between. The line was in use until 1930. The railroad from Tocoi to Tocoi Junction, outside St. Augustine, was built by the St. Johns Railway. The Jacksonville, St. Augustine and Indian River Railway took it over by 1894, and changed its name to the Florida East Coast Railway in 1895. The line was abandoned by 1917; it was later used for SR 95, which became SR 214 at some time after the 1945 Florida State Road renumbering, and is now CR 214. The almost arrow-straight Moultrie Cutoff was built in 1925 to cut the distance on the main line, avoiding the swing inland to East Palatka. It runs from just north of Bunnell to Moultrie Junction in St. Augustine. This was originally built by the Jacksonville and Atlantic Railroad from Jacksonville to Pablo Beach (now Jacksonville Beach). It was later extended north along the coast to Mayport and taken over by the FEC. In 1890, the Jacksonville, St. Augustine and Halifax River Railway (the line north of St. Augustine) changed from narrow gauge to standard gauge.